MEC Fuels & Chemicals (MEC) is excited to announce that it became an Industrial Partner for the National Science Foundation (NSF) Center for Innovative and Strategic Transformation of Alkanes Research (CISTAR). CISTAR’s vision is to create a transformative engineered system to convert light hydrocarbons from shale resources to chemicals and transportation fuels in smaller, modular, local, and highly networked processing plants. MEC recently attended CISTAR’s Fall meeting at University of New Mexico’s beautiful campus in Albuquerque and provided feedback on highly innovative R&D carried out by CISTAR researchers. MEC looks forward to continue participating in CISTAR’s innovation ecosystem consisting of continuous interaction among faculty, student researchers, companies, and non-industrial stakeholders such as government agencies, regulators, NGOs, and consumers to accelerate the commercialization of CISTAR’s technologies. The CISTAR team has been developing innovative process designs for economic production of liquid chemicals and transportation fuels from shale gas hydrocarbons. Researchers have also been exploring novel approaches for converting methane to chemical intermediates, which can then be used as a feedstock for conversion to liquid fuels. The NSF will provide $19.75 million over five years for the center. Industrial and university partners will contribute additional funding and critical resources. The center includes academic teams of researchers from Purdue, the University of New Mexico, Northwestern University, the University of Notre Dame and the University of Texas at Austin, as well as partners from industry, national laboratories and national and international research organizations (https://www.purdue.edu/newsroom/releases/2017/Q3/nsf-funded-center-at-purdue-could-help-power-u.s.-for-next-century.html). For more information about the center, please visit https://cistar.us/. If you are interested in learning more about this partnership, please visit https://mecfuelchem.com, call 713-344-0652, or email manager@mecfuelchem.com. Please follow @MEC Fuels & Chemicals on social media for updates on MEC’s reactors/testing equipment, catalysts/adsorbents, R&D and future news & events! Please join us for Houston’s Petrochemical Professional Network’s Happy Hour at Sigma Brewing Company. Come network with petrochemical professionals in the Greater Houston area and learn about each others work in water treatment, catalysis, refining, safety, and more. Dr. Mayank Gupta, President & CEO of MEC Fuels & Chemicals will be the guest speaker for the event. Suez Water Technologies & Solutions will be sponsoring beverages for attendees. We look forward to seeing you at the event. Please follow @MEC Fuels & Chemicals on social media for updates on MEC’s reactors/testing equipment, catalysts/adsorbents, R&D and future news & events. MEC Fuels & Chemicals would like to thank everyone who attended our event at the UH Innovation Center on 8/8/18! The attendees included members of academia and industry from all over the Greater Houston Area. A special thanks is extended to the UH Innovation Center Team for their help in the execution of a successful event. The MEC team is currently working to make the next event even better. We look forward to seeing you at MEC’s next event. Stay tuned! Please join us for MEC products showcase & networking with academia and industry professionals in Catalysis, Sustainable Agriculture, Biofuels, Solar, Petrochemical, Oil & Gas, and Water Treatment. We have attended several great networking events in Houston area. However, we recognize the need for a single event that brings professionals together in all the aforementioned areas. So we decided to start organizing such events. If we want to solve the world’s food, energy, environmental, and water crisis, we will have to work together. So let’s meet and learn about each other’s expertise and explore any potential for collaboration. FREE food and beverage will be provided. RSVP is required. Space is limited so please RSVP to manager@mecfuelchem.com ASAP if you plan to attend. We look forward to seeing you at the event! MEC Fuels & Chemicals will be showcasing its reactor, lab equipment, and catalysts/adsorbents at the 3rd International Conference on Catalysis and Chemical Engineering February 25 – 27, 2019 in the energy capital of the world: Houston, TX, USA. CCE-2019 is dedicated to creating a valuable and important platform that inspires international and interdisciplinary exchange of the latest results and advanced methods at the forefront of catalysis and chemical engineering research. Over the course of 3 days, internationally-renowned speakers will describe how their research journeys have developed in response to contemporary challenges, inspirational lessons in chemical initiatives and creativity. For more information on the conference, please visit http://unitedscientificgroup.com/conferences/catalysis. If you would like to attend or exhibit at the conference, please use promo code MEC25 to receive a 25% discount on registration fees. 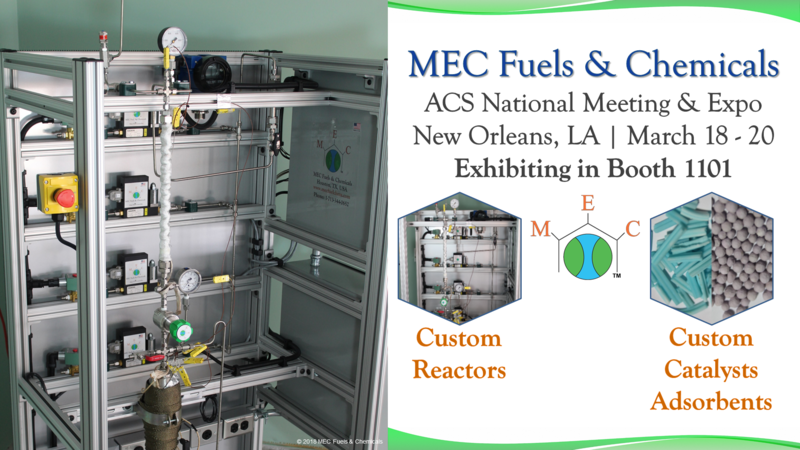 MEC showcased its custom reactor and catalysts/adsorbents at the American Chemical society (ACS) National meeting and expo in New Orleans, LA from March 18th to March 20th, 2018. This conference focused on the nexus of food, energy, and water. Over 15,000 attendees from around the world attended the conference. 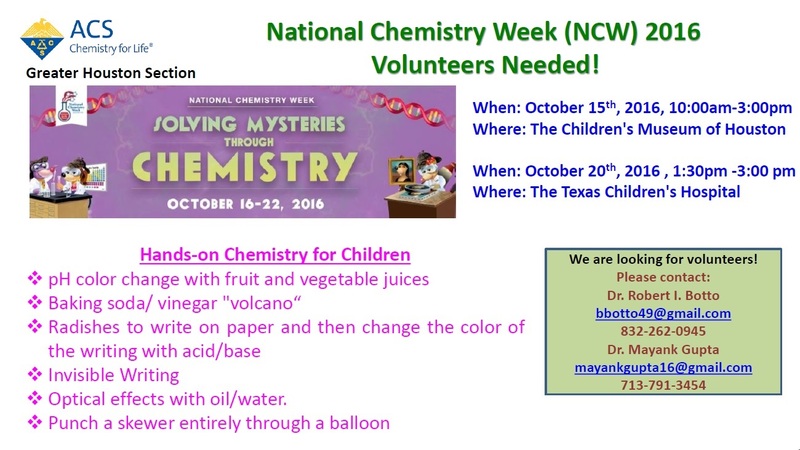 ACS is a scientific society that has more than 158,000 members world wide, in the fields of chemistry, chemical engineering, and related fields. MEC engaged members of academia and industry to discuss their R&D needs and MEC’s solutions. We look forward to working with them and their team! 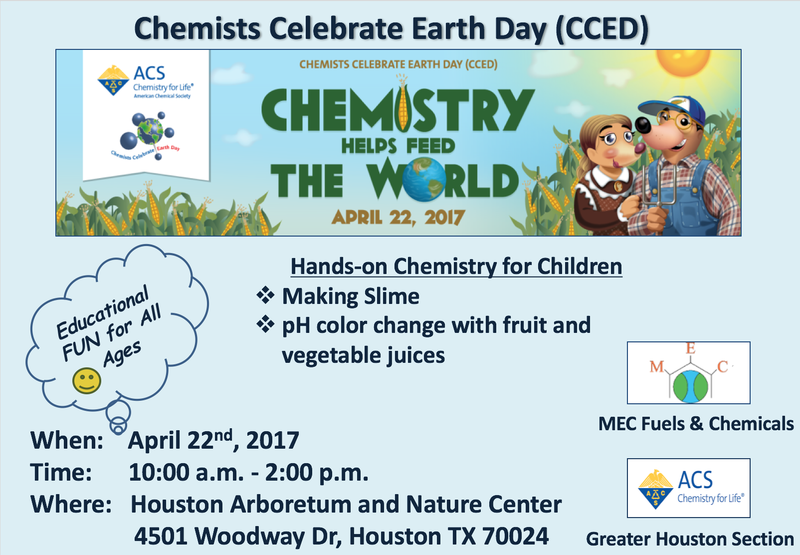 MEC Fuels & Chemicals and ACS partnered together to bring a day filled with fun chemistry experiments and spreading awareness to keep our Mother Earth clean. Around 300 children and their families attended the event. View pictures of this successful event here.